Gaithersburg, Maryland, USA – July 13, 2015 - GL Communications Inc., announced today its latest RTP Video Traffic Generation and Analysis software. He added, “GL's Protocol Emulator platform MAPS™ (Message Automation and Protocol Simulation) performs signaling and traffic generation for a vast array of communication protocols covering IP, Analog, TDM, and Wireless Networks. As a new enhancement, the RTP Video Traffic Generation capability is now added to GL’s MAPS™ SIP, which can be used in IP networks to evaluate the performance of the network with video traffic. 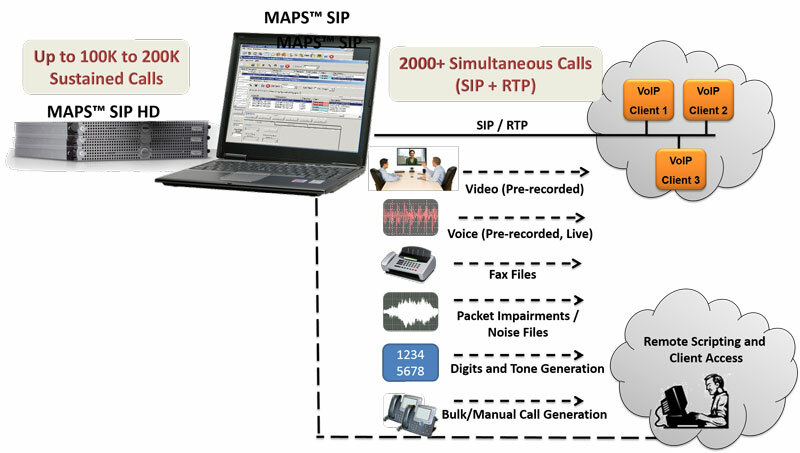 MAPS™ also supports transmission and detection of various other RTP traffic types after call establishment, including Digits, Tones, Voice Files, Live Voice, and Pass-thru Fax. GL's MAPS™ SIP is also available as an High Density (MAPS™ HD) special purpose 1U network appliance analysis w/ 4x1GigE or 2x10GigE interfaces that is capable of high call intensity (hundreds of calls/sec) and high volume of sustained calls (tens of thousands of simultaneous calls/1U platform). Similarly, GL’s PacketScan™ (All IP Packet Analyzer) can capture and monitor live signaling, audio, and video traffic over IP networks, and perform various measurements. Almost all VoIP and Wireless protocols over IP transport layer can be captured and decoded for trouble-shooting network problems. GL also provides PacketScan™ HD for High Density IP Traffic Analysis w/ 4x1GigE or 2x10GigE interfaces along with a File Based IP Traffic Analyzer Server for near real-time processing of traces. Mr. Vadalia further explained, “MAPS™ SIP provides the Bulk Video Call Simulation capability using its pre-recorded video traces supporting codecs like H.264, H.263 etc. On a high-performance computing platform (core-i7), it is possible to generate more than 500 simultaneous video calls. With a High Density (MAPS™ HD) platform, it is possible to achieve further more capacity. H.263 provides video capture and video conference monitoring capability, while H.264 is an industry standard codec for video compression. H.264 codec offers better compression performance over previous standards. GL's PacketScan™ provides the ability to monitor / record signaling, audio (wav files), and video (in QuickTime *.qt format) data of a session to files, allows user to perform powerful video analysis per call. Note that currently the video recording feature is supported only for H263+ codec. However, video QoS statistics are available for all codecs. In addition, PacketScan™ supports all most all industry standard protocols. Users can listen/record audio and video data of a session in real-time; perform power, frequency, spectral, tone and digit analysis, and video analysis with ease and precision; and get an exact picture of QoS (quality of the service). The application is capable of displaying Video QoS Statistics such as Source/Destination Video Channels, Media Type, SSRC, Total Packet Counts, Missing Packets, Duplicate Packets and Out of sequence Packets, Average Delay/Gap, Video Frame Count, Frame rate, Media Delivery Index (MDI-(Delay Factor: Media Loss Rate)), and Average MDI for each video session.